ICYMI, here's the full text of David Cameron's farewell speech as UK Prime Minister. 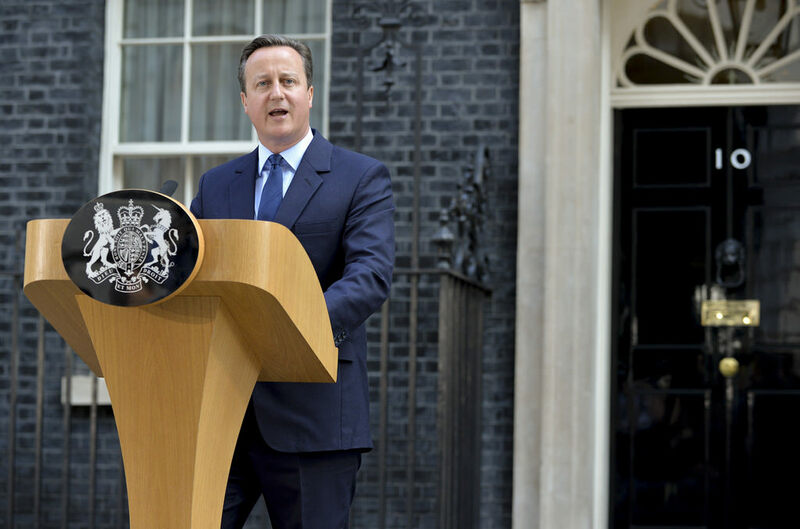 By News Desk | London: "When I first stood here in Downing Street on that evening in May 2010, I said we would confront our problems as a country and lead people through difficult decisions, so that together we could reach better times. It has not been an easy journey, and of course we have not got every decision right, but I do believe that today our country is much stronger. Above all it was about turning around the economy. And with the deficit cut by two-thirds, two and a half million more people in work and one million more businesses, there can be no doubt that our economy is immeasurably stronger. Politicians like to talk about policies, but in the end it is about people’s lives. I think of the people doing jobs who were previously unemployed. I think of the businesses that were just ideas in someone’s head and that today are making a go of it and providing people with livelihoods. I think of the hard-working families paying lower taxes and getting higher wages because of the first ever National Living Wage. I think of the children who were languishing in the care system and who have now been adopted by loving families. I think of the parents now able to send their children to good and outstanding schools, including free schools that simply didn’t exist before. I think of over 200,000 young people who have taken part in National Citizen Service, the fastest growing youth programme of its kind in the world, something that, again, wasn’t there 6 years ago. I think of the couples who have been able to get married, who weren’t allowed to in the past. And I think of the people on the other side of the world who would not have clean drinking water, the chance to go to school, or even be alive, were it not for our decision to keep our aid promises to the poorest people and the poorest countries in our world. And we have used our stronger economy to invest in our health service. When I walked in there, there were 18,000 people waiting over a year for their operation. Today it’s just 800. Too many. Still too long. But our NHS is a national treasure, and one whose staff perform miracles as I’ve seen every day. And we’ve strengthened our nation’s defences, with submarines, destroyers, frigates and, soon, aircraft carriers, rolling out of our shipyards to keep our country safe in a dangerous world. These are the choices and the changes that we have made. And I want to thank everyone who has given so much to support me personally over these years. The incredible team in No10, the civil servants, whose professionalism and impartiality is one of our country’s greatest strengths. And my political advisers, some of whom have been with me since the day I stood for my party’s leadership 11 years ago. I want to thank my children, Nancy, Elwen and Florence, for whom Downing Street has been a lovely home over these last 6 years. They sometimes kick the red boxes full of work. Florence, you once climbed into one, before a foreign trip, and said take me with you. No more boxes. And above all, I want to thank Samantha, the love of my life. You have kept me vaguely sane and, as well as being an amazing wife, mother and businesswoman, you have done something every week in that building behind me to celebrate the best spirit of voluntary service in our country. We will shortly be heading to Buckingham Palace to see Her Majesty the Queen, where I will tender my resignation as Prime Minister and I will advise Her Majesty to invite Theresa May to form a new administration. I am delighted that for the second time in British history the new Prime Minister will be a woman, and once again, a Conservative. I believe Theresa will provide strong and stable leadership in fulfilling the Conservative Manifesto on which we were elected, and I wish her well in negotiating the best possible terms for Britain’s exit from the European Union. Let me finish by saying this. The spirit of service is one of this country’s most remarkable qualities. I have seen that service day in and day out in the incredible work of our armed forces, our intelligence agencies and our police. It is something I always knew. But as Prime Minister you see it so directly that it blows you away. And of course writing those heart-breaking letters to the families who have lost loved ones is a poignant reminder of the profound scale of what these men and women give for us in the defence of our freedoms and our way of life. We must never forget that. In a different way, I have seen that same spirit of service in the amazing contributions of countless volunteers in communities up and down our country who are making our society bigger and stronger. And I am proud that every day for the past 2 years I have used the office of Prime Minister in a non-political way to recognise and thank almost 600 of them as Points of Light whose service can be an inspiration to us all. For me politics has always been about public service in the national interest. It is simple to say but often hard to do. But one of the things that sustains you in this job is the sense that, yes, our politics is full of argument and debate, and it can get quite heated, but no matter how difficult the decisions are, there is a great sense of British fair play, a quiet but prevailing sense that most people wish their Prime Minister well and want them to stick at it and get on with the job. So I want to take this moment to say thank you to all those who have written letters and emails offering me that support, people who I will never get to meet and never get to thank personally. It has been the greatest honour of my life to serve our country as Prime Minister over these last six years, and to serve as leader of my party for almost eleven years. And as we leave for the last time, my only wish is continued success for this great country that I love so very much."